Detailed research into the energy use of SuperHomes reveals that, on average, they are using 40% less energy per square metre per year than the average UK home. SuperHomes are, therefore, much cheaper to run than their unrefurbished neighbours. Chester SuperHome. Whilst bills are similar to the owner’s previous home, that home was half the size! The most energy efficient home in the study, whilst offering improved comfort, uses a staggering 86% less energy than the average home. So, whilst low-carbon and low-energy don’t necessarily go hand in hand, this study confirms that SuperHomes excel in both respects. Is over 40% more energy-efficient than the average UK home in its energy use per square metre per year. Consumes about 19% less total energy than the average UK home each year, despite having a larger than average floor area and a higher than average occupancy, and being older than an average house building. Uses 104kWh of energy per square metre per year, compared with a national average of 177kWh/m2/yr. Consumes a total of 14,722kWh of energy per annum, compared with an average household consumption of 18,100kWh. The most energy-efficient SuperHome in the survey (refurbished to the exacting Passivhaus standard) was found to use just 25kWh/m2/yr, an impressive 86% less than the national average. 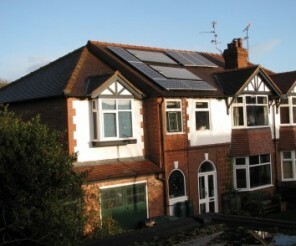 SuperHomes are older homes refurbished by their owners to deliver a carbon saving of at least 60%. The owners host free open days in September to share the benefits and the challenges of home refurbishment. Researchers at the National Energy Foundation (NEF) calculated the energy and carbon figures for a representative sample of the existing 205 SuperHomes, by per person per year, and by per square metre of floor space per year. Using the 2012 National Energy Efficiency Data-Framework (NEED) sample, NEF was able to make comparisons between an average SuperHome and the average UK home with the same number of occupants or of the same size.